Skin is artist Goshi Uhira’s first collection of works. In its pages, the fine complexion and texture of his subjects are captured through careful scaling of black and white tones. He uses paper that is soft and seemingly moist, that when one scrutinizes the images closely, it is not the printing-specific halftone dots but cell-like particles that preside. The fiber of the paper and the sheen on it elicit a skin-like illusion. Skin is one of Uhira’s attempts to come to terms with himself and to question his origin and existence. As if to embody this, some of the images, including the one used on the cover, are of his own skin. For Uhira, the body is an unknown territory like that of a sacred shrine, and something to be acknowledged with reverence for being part of nature. To know oneself is to also comprehend the existence of much larger beings. In this process, Uhira views the skin of the others as an extension of his own self and pursues what is hidden in the depth of mankind, or of the world. The book also includes an essay, “An Intrinsic Kosmos,” by Tomohiro Akiyama. Published in August 2018 by Goshi Uhira. Printed and bound in Japan by Shumpousha Co., Ltd.
First edition of 500 unnumbered copies. Goshi Uhira’s Skin is a collection of close-up photographs of human skin. 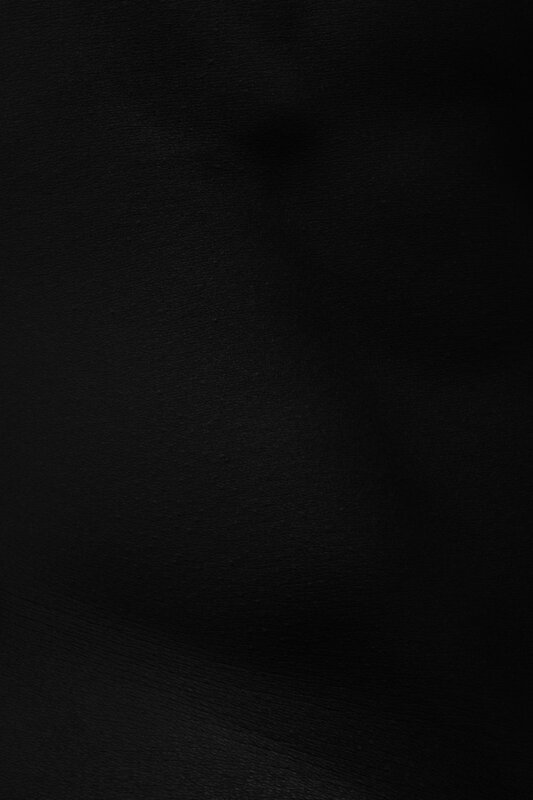 Skin with various textures is pictured in a delicate gradation of black color. The subject of Skin does not have any extraordinary expression. Each image frames an isolated part of the human body which cannot be associated with the whole body. This invites readers to pay full attention to each tiny trimmed Skin, as if they were re-experiencing the artwork through the artist’s eyes. How seriously have you ever faced your own, or someone else’s skin? We all have skin: skin defines the boundary between one’s body and its surrounding environment. However, it is often too close for us to pay serious attention to, except for the purpose of making oneself look good. Uhira’s Skin is an attempt to let us face skin, away from the purpose of controlling one’s appearance. This attempt could be considered as Kojikyumei, a Japanese Zen word, which means ‘a search for one’s true self’. It is inevitable for us to be obsessed by ego and various stereotypes. Kojikyumei is a process to dispel obsessions and be aware of the intrinsic nature of everything, eventually to transcend ego. Skin, in other words, is a trial of Uhira to re-discover himself. In fact, several images including the book cover are of his own skin. In this way, he is telling us the importance of reflecting on ourselves. Knowing oneself means understanding the world surrounding oneself. Why? Because in order to better understand oneself, you must seriously think about questions such as ‘What is the universe?’, ‘What/how is a human being meant to be?’. In this sense, Uhira’s Skin could be an attempt to answer a classic, philosophical question of relations between ‘part’ and ‘whole’. The unique characteristics of these artworks can be summarized in the following three points. The very first thing which attracted my attention was the fact that the skin is depicted in black and white (duotone in the process of printing), despite the fact that human skin would be reflected in various colors in our eyes. As a result of this conversion into grayscale images, color is no longer a symbol of difference among individuals (including racial implications). This idea reminds me of Spiral Dynamics: a theory of the evolution of human consciousness. According to this, human evolution is divided into eight stages by the vMeme (value Meme), that is, value consciousness. From the beige color of the instinctive stage to the turquoise color which represents spiritual need, the eight stages are represented in different colors (recently, coral and teal have been suggested as examples of higher levels of existence). This theory is developed based on several researchers’ long-term work on racial problems, and has the intention to divert people’s attention away from the color of skin. Uhira appears to embrace a similar idea; he transcends the difference of skin colors by illustrating skins in grayscale, calling people’s attention to an integral view without discrimination. In addition to his approach to ‘color’, the ‘pattern’ on skin itself attracted my attention. The mesh-like pattern that spreads over the grayscaled image looks like Indra’s net. Indra is a Vedic deity in Hinduism, i.e., the king of the highest heaven. Indra was introduced into Buddhism and called Sakra, also known as Dìshìtian in China, and Taishakuten in Japan. Indra’s net covers the palace in highest heaven; knots across the net are made of jade stones which reflect images of all the other stones. In other words, the countless number of gems form the universe, while each stone represents one independent universe in itself. Even in human skin, which is such a common object, inheres Indra’s net, and each knot across the net represents a numerous number of universes. When all these universes interact with each other, they form a much larger universe together. I found such a Kosmology hidden behind Skin. Uhira’s work seems to not only be rooted in legendary stories and religious beliefs, but also in the latest findings of science. The cosmos, from its beginning through to this very day, has been generating various new connections: a particle connects with another particle, a cell connects with another cell, an organism connects with another organism, and a human being connects with another human being. It is within the great chain of cosmic correlation that everything exists together. Humankind, as a part of nature, is not an exception: it creates culture, and goes back to nature. We exist only in the context of this long history of cosmic correlation. Finally, Uhira’s work not only gently embraces each individual person, but also firmly insists the importance of each individual’s independence. His stoic style underlying these artworks, colorlessness through grayscale, firmness in trimming which does not allow any of our imagination to go beyond the rectangular image, simpleness of layout, calls for questions such as ‘Have you cherished others’ existence?’, ‘Have you cherished your own existence?’, ‘How do you live your life?’. This sternness reminds me of Danish philosopher Søren Kierkegaard. In 1855, he wrote a booklet called The Moment, and criticized the secularization of Christianity. ‘Are you somehow idly living from Monday to Sunday? Somehow getting out of the house, going to work, then coming back home again. Speaking to your families somehow, eating food somehow, going to bed somehow. Clearly, it is not a crime to live like this, but it is a sin. When Sunday comes, go to church and worship, and it would seem that the sin to live in such an ambiguous attitude is forgotten. Stop that kind of worship!’ Søren Kierkegaard insisted that people should quest for the true meaning of life. Uhira’s Skin, as was Kierkegaard’s The Moment, urges us to search for our true nature, and to think seriously about the Kosmos through our body. Uhira’s Skin embraces contradicting concepts, including those such as ‘part’ and ‘whole’, ‘individual’ and ‘collective’, ‘gentleness’ and ‘firmness’. Without any doubt, Skin represents a holon. A holon is a unit that has characteristics of both part and whole. Skin, in a sense, cannot be more than a part of the human body. Skin, however, at the same time, is an infinite universe that includes many more universes. Like this, the world consists of many hierarchies in different levels with different directions, that form nested structures. Therefore, in order to better understand the world, we need to continue shifting our standpoint between a discriminating view (to distinctively accept things through comparison with others) as well as a non-discriminating or integral view (to accept everything as it is). Uhira’s Skin describes the great chain of being, and questions us about the meaning of life. Exactly in what way should I live my life?